Oh My Yumbles, it’s been far too long. Sometimes life just happens, and when it does, it’s always worth making some time for yourself to clear your mind and just chill out. One of my favourite ways to relax is by baking and trying out new recipes in the kitchen (yes, really). Recently I tried out the Minimalist Baker’s 2-Ingredient Vegan Chocolate Truffles which truly were a treat and a half for my tastebuds. However, I felt the recipe needed a bit of tweaking and I fancied Lucy-fying them a tad. 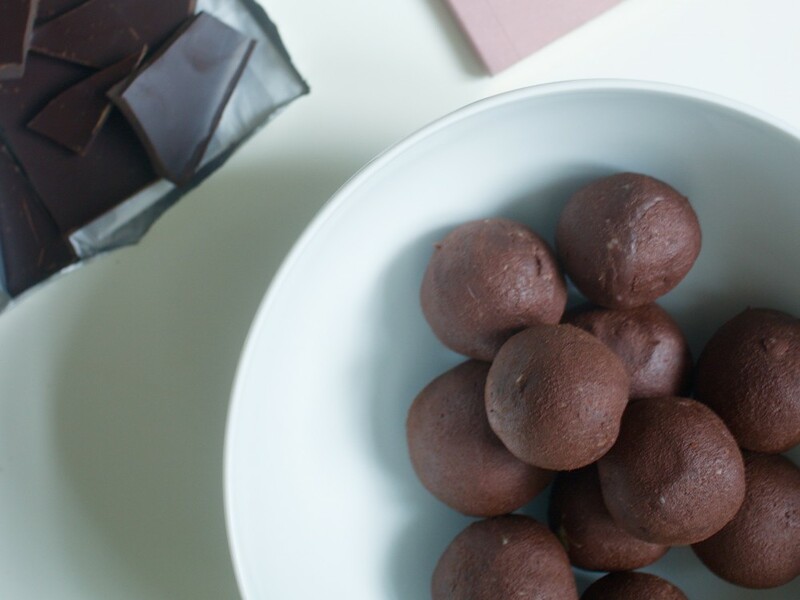 So, I’m back with a bang and am proud to present to you this fabulous and ridiculously simple recipe for dairy free, vegan chocolate truffles. Dairy and too much sugar wreaks havoc upon my skin and general wellbeing, which is a nightmare as a chocoholic. These however feature delicious dark chocolate which by nature is dairy free, and also coconut milk. I decided on adding a squeeze of fresh orange for a hint of Terry’s Chocolate Orange goodness, and because dark chocolate and orange are a match made in flavour combination heaven! These would also make a fabulous little gift for someone this Christmas, especially for someone who’s into healthy eating but could happily demolish a Terry’s Chocolate Orange! Bash up your chocolate into a bowl into small chunks. Gently heat the coconut milk into a saucepan to a simmer, or until it begins to gently bubble. Take off the heat and pour over your chocolate. Cover the bowl with a tea towel and leave for 5 minutes or so. Give it all a gentle stir and if the chocolate hasn’t completely melted, pop it into the microwave for 30 seconds or so, until it has all combined into a gorgeous, silky texture. Add in your orange and pinch of salt and stir to combine. Leave to set in a cool, dry place for a few hours. Once your mixture has set into a soft ganache, using a teaspoon, scoop out a ping-pong ball’s worth of a mixture and roll between the palms of your hands. Feel free to add in an additional dunking of cocoa/cacao powder, chopped nuts, melted dark chocolate… whatever you fancy.